© Graham Morrison tears himself away from updating Arch Linux to search for the best new free software. The open sourcing of this cartoon-drawing application was a huge story because it was partly based on a piece of software called Toonz. Toonz was used and customized by Studio Ghibli over many years as it produced its monumental catalog of genre-defining movies. If you've not seen anything by Studio Ghibli, you have to watch both Spirited Away and My Neighbor Totoro as this month's homework. Which is why it was so remarkable when the company released its software as open source. It didn't matter that this might be because it was bought by a larger company or because Studio Ghibli wanted to own the standard tool that artists are going to want. The result was a best-in-class animation tool that was free to use and free to fork and modify. The team responsible for the Linux conversion is also due a huge amount of credit, because without them, there wouldn't be a Linux version. Only Windows and OS X were supported by the original release, and it's taken some serious code refactoring to get the Linux version near a stable release. We've been watching development for a while, and it's only over the last month or so that we'd recommend finally trying to get hold of OpenToonz and running it. We built the current version from source, but you should find pre-built packages as its stability continues to improve. You also need to be prepared for quite a learning curve. Rather than what some might assume will be the simplicity of an application like Deluxe Paint, OpenToonz is a seriously professional proposition. That means there are very few concessions to usability, with a user interface geared toward creative freedom and flexibility. However, you can go a long way by thinking of the user interface as a two-dimensional version of Gimp. Time goes down the Y-axis and layers go from left to right along the X-axis. Illustrations can be scanned or drawn and placed into a cell in this grid and animated through the use of an onion skin with each new row. 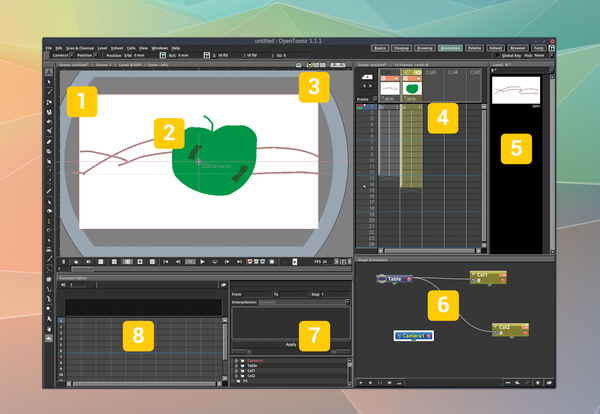 OpenToonz provides lots of plugins and effects for processing and manipulating not just the original images, but how they transition over time – just as you can manipulate video in a video editor, for example, only with clips going down rather than across. You can also perform lots of other functions. The way the images, cells and camera are abstracted means you always maintain maximum quality, which is the most important feature when you're printing your animation to 35mm film for projection onto the cinema screen. In fact, everything except the stability of this application feels professional, from the learning curve, to the plugins, to the sheer complexity of the many dialogs. But don't let that put you off. Stability is improving every week, and there's already an avid community willing to help each other get the most out of this fantastic tool. 1 Tool palette. Works just like the palette in Inkscape. 2 Image editor. Preview your animation and draw onto the screen. 3 Model selector. Different modes let you dive into different details of your project. 4 Level manager. Just like video editing, only with vertical tracks and more keyframes. 5 Level preview. Levels are separate layer elements that can move independently. 6 Project schematic. See how everything is linked together. 7 Interpolation. Dynamically control movement between frames. 8 Function editor. Create mathematical curves for smooth movement.